YOU ARE GOING TO LOVE THE NEWEST ARTISTIC OUTPOST RELEASE!! 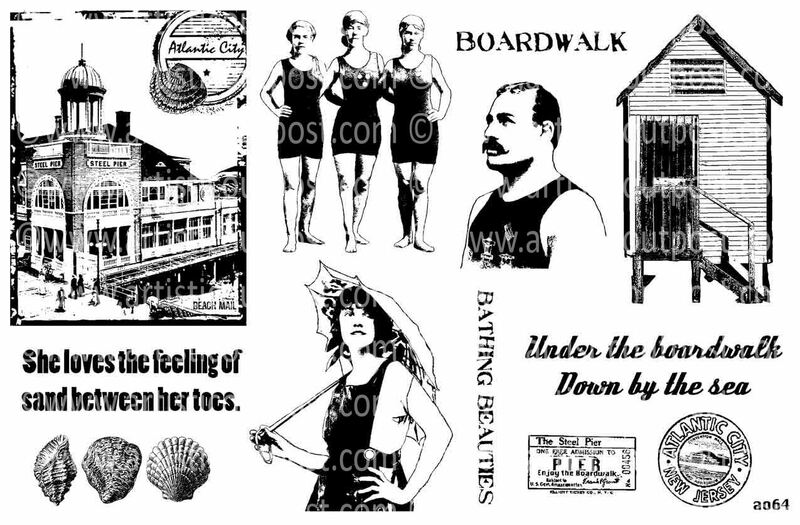 For the love of the Jersey Shore and Atlantic City's historic boardwalk, this stamp collection features an ATC sized collage featuring the Steel Pier, bathing beauties, a handsome gentleman, and other summertime elements sure to stir up your creative side. Don't ya' just love it! I saw something like this done as a larger piece at a craft show earlier this year, and just had to try my hand at making one for myself. My little houses were painted with distress paints....all in a haphazard way on watercolor paper. The sand was painted with a brush. The frame was bright red when I started, covered with gesso, then ultra thick get medium was applied. 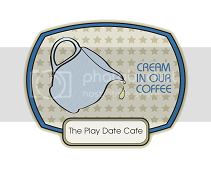 While wet, I pressed in a texture plate for the design. When dry, I swished on different distress paints and sprayed them with water. Here's a little close up. This is truly a fun set to add to your collection. 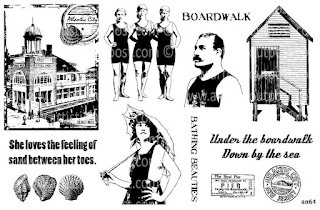 Right now enjoy new stamps and a Memorial Day sale with 15% off all rubber stamps at Artistic Outpost. No coupon code required. Your discount will be reflected in your shopping cart. Stock up on some new designs and enjoy your summer! This sale ends June 8th. 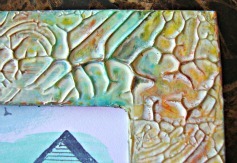 I love the windswept look of the paint over the beach huts and the texture on that frame is completely fabulous - wow! 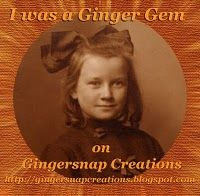 Oh Gerrie, I LOVE how you colored your images! That is just so cool and I am totally drooling over your frame. I need to step it up and try some of these amazing techniques. Thanks for the inspiration! Gerrie, I really liked what you did with the boarder! The new stamp set from A.O. is fantastic, too. Very artsy! 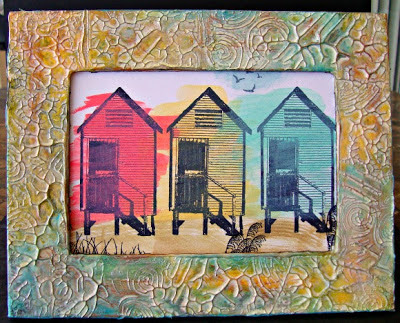 Love the bright colors splashed over the beach houses,and the texture on the frame is just fabulous! 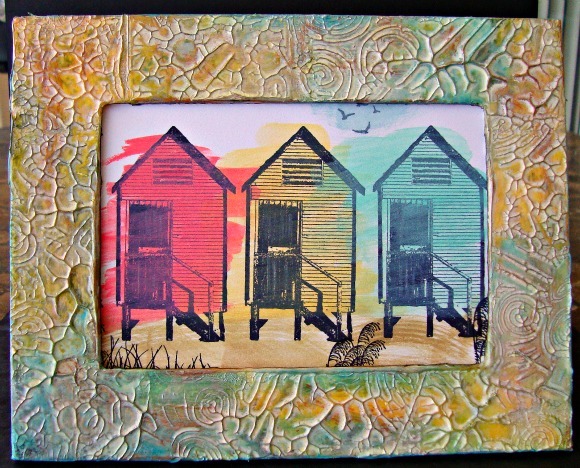 Wow, that textured background on the frame is amazing and the beach houses look so awesome with the vibrant colors! Summer fun, GF! Love this! Such a fabulous textured frame! The color combo is beautiful! Perfect for summer. I love it! Love the beach houses with the tints of color. And, Wowza- really love the frame you created! Love how you created the beach houses, but that frame totally ROCKS!!! Fantastic frame and beautiful beachy scene! Love the texture and the beautiful colors! I hope you feel better soon. This is fabulous! I love what you've done with that stamp. Awesome! Gerrie, this is AWESOME!!! I love love love the frame...just stunning! The image of the triple colored houses is just fabulous as well...love the bright colors and the artsy feel! 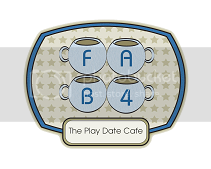 Fabulous design!!! WOW, WOW, WOW, oh my goodness, what an exciting card you have created very different and unique, the framing is gorgeous, and the way you colored them, windswept, Alison said describes it beautifully, thanks for sharing and have a wonderful day..
love the houses. love the frame!